Eichendorff took second place with a very lively ride in the Freestyle at the 4-star CDI4* in Achleiten. "Edi" did his very best (in spite of the tropical temperatures), was most attentive and his transitions from one movement to the next went smoothly. One tiny error cost a point but that didn't really diminish the overall presentation of my meanwhile 17-year old friend. 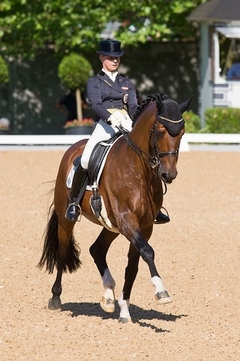 76.32 percent meant second place right behind Steffen Peters/USA, who started with his young Rosamunde followed by Marcela Krinke Susmelji/SUI who took third with Smeyers Molberg / 75.27 percent) and fourth placed Kathleen Raine/USA with Breanna (75.50 percent). I am so proud of Eichendorff, he's been so unbelievably consistant in his ride and always placing in fields with first class competitore. 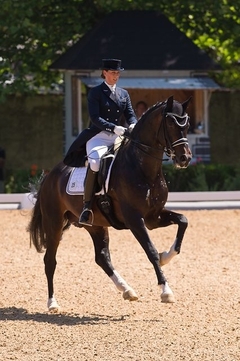 In his first international St. Georges, San Francisco OLD ridden by Wibke Bruns/GER received 70.97 percent, finishing sixth behind the winning couple from the US, Kimberly Herslow on Rosmarin (72.10).